Welcome to Fifth Wheel Magazine, an online magazine covering fifth wheel campers, toy haulers, fifth wheel hitches, fifth wheel accessories and manufacturers. Fifth Wheel Magazine provides potential Fifth Wheel buyers, new owners and Fifth Wheel veterans with information on the latest accessories, custom user tools and news about the Fifth Wheel RV industry. Subscribe and get new articles e-mailed direct to your inbox each month. Easily manage your subscription on-line. Subscribe and get access to our custom online tools, that can be accessed from any mobile device. Research new truck and Fifth Wheel purchases with our Fifth Wheel Owner Towing Data Tool, that shows Fifth Wheel, MPG and truck combinations of other owners. 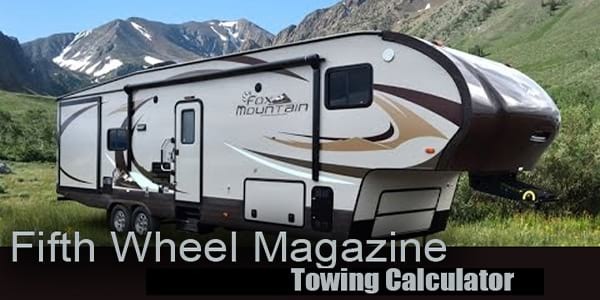 Use our Free Fifth Wheel weight calculator to research if truck and Fifth Wheel combinations are overweight before you buy or tow.Researching buying a truck to tow a Fifth Wheel?. Use our Truck Finder to find trucks that can tow a 5th Wheel. 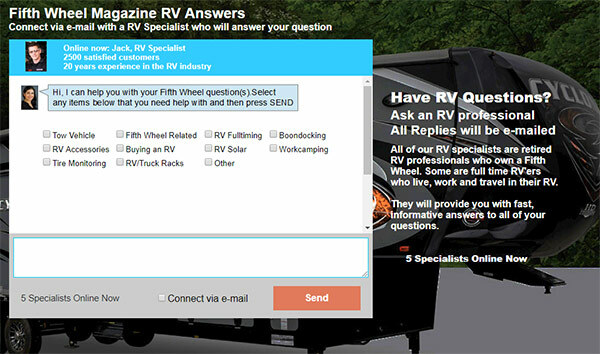 Click on the Fifth Wheel Questions icon at the top of the page, and get immediate answers to questions on Fifth Wheels, Accessories, Solar, Boondocking, Tow Vehicles, Buying a Fifth Wheel, Tire Monitoring Systems, Workcamping and Fulltime RV living, from an online specialist.